Missing from this book is handholding and screenshots as this is all meat without any fat weighing the book down. The table of contents helps the reader hone in on the topics and functions they will be most interested in without long-winded explanations. While all of Mountain Lion’s 200 new features aren’t covered a large number are covered with just enough detail to make them useful such as Airplay, Notifications, and dictation. 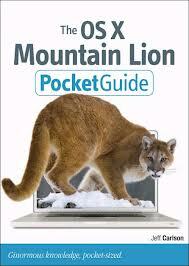 Need to get up to speed on Apple’s latest cat quickly? This is the book for you.